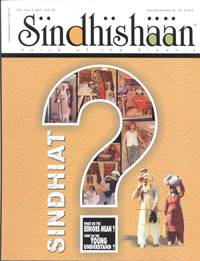 I am very thankful to have received the magazine Sindhishaan, Issue no. 2. I have gone through its contents very vividly. No doubt that the set-up and get-up of the magazine is not only the appreciating factor, but its standard, quality and contents will certainly occupy a pivotal position among the periodical magazines published so far in English, related with the Sindhi multifold activities. In this regard yours is a distinguished magazine. Finally, I express my gratitude on behalf of my readings and perceptions, which permit me to say that the current issue has excelled to the previous issues. In fact, I had stored some comments and suggestions regarding the 1st issue, but you have, without knowing them, obviated those shortcomings.